Did Obama Order FEMA Burial Coffins? NO. Here’s Why. Rumor has it that the US President Barack Obama has ordered thousands of “FEMA coffins” and has them stockpiled, and those rumors also show supposed photographic evidence. However, the photos often provided as evidence simply show coffin liners commonly used by burial agencies, who put coffins inside this kind of liner before burying a coffin, instead of burying a coffin in direct contact with dirt. The plastics company that makes them, Vantage Products Corporation stores around 50,000 of them at a time, to help supply the market for approximately 900,000 ground burials in the US each year. 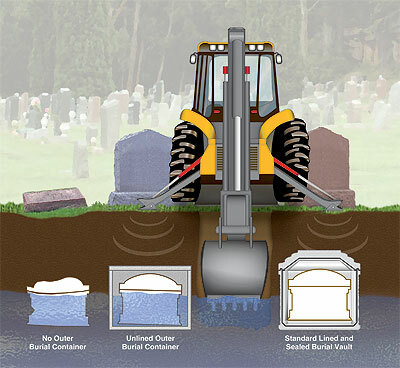 When a backhoe is used to dig a burial pit, the hydraulic stabilizers press down on the ground of nearby burial plots and could crumple below them had they been buried exposed directly to the earth. The coffin liner helps reduce the deterioration of the coffin itself by preventing the coffin from coming in direct contact with the earth, and helps stabilize the dirt layer above it for when the stabilizers put so much more weight than normal and preventing the earth from collapsing onto the coffin and possibly destabilizing the surrounding earth. In an article from August of 2008 (months before Obama was even elected in November of that year), the managing editor of the Morgan County Citizen writes, (titled, “Conspiracy or simply storage? Theories surface around vaults stored in Madison“) that Vantage Products Corporation Vice President of Operations Michael Lacey began getting an overwhelming number of calls starting around July 2007 after someone published a rumor about his company’s inventory. An American TV program, Conspiracy Theory with Jesse Ventura, has an episode that examines these ordinary coffin liners as if it were some outrage that they could possibly fit up to 4 bodies at once, and after speaking with an official to discover that they’re being stored for peoples’ pre-needs, asks “Who in the hell needs this many coffins?” as if a single sourced ordered all of them for later mass-implementation. That’s a bit like asking who needs thousands of pounds of cranberries, which could be used to be lodged in peoples throats to choke them, unless they’re expecting to lodge them in the throats of that many people in a giant undercover cranberry-related choking massacre. No, that many cranberries would naturally be distributed across the nation or world markets that have existed for decades. Not a single group of people need millions of coffin liners, likewise, as this stockpile of liners go to supply part of the nation’s very ordinary need for coffin liners. The Ventura show also very weakly (!) attempts to connect Halliburton to Vantage by suggesting that Vantage was once an R&D arm of Hercules Inc, and that Hercules was a part of Halliburton. The particular Hercules that relates to Vantage is Hercules Powder Company that produced chemical and plastics products such as Cool Whip containers and has ties to DuPont, not Halliburton. Ventura doesn’t describe what ties Hercules supposedly has to Halliburton, if it even really does. Ventura does so little research that he refers to the “coffins” as having lids included — but the “coffin” IS the lid in this case. and doesn’t “hold” anything like a typical lidded container would. A normal burial coffin rests on a flat surface that would otherwise appear to be the inside of the “lid”, and the shell of the coffin liner latches onto the base like a kind of protective dome, encasing the actual coffin inside the liner with the connections on the flat surface the coffin rests upon. DemocraticUnderground.com has a post back from September of 2006 discussing the matter, well before Obama was even a twinkle in the eye for the presidency. Several other sources have investigated the issue into even greater and more intricate detail to demonstrate the falseness of this hoax, including Misery Index, Metabunk.org, Waffles At Noon, and Popular Mechanics.